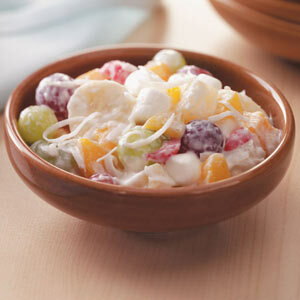 My mother in law introduced me to Ambrosia, a mythical salad if you will., a few years back during the holidays. At first, I was skeptical and thought how can something with sour cream in it be sweet. Oh boy was I wrong! I tasted it and loved it! I looked up where Ambrosia originated from and the Food Time Line website says it was considered a “food of the Gods” an “American Dessert“. It sweetness will sweep you away into clouds of Mmm Mmm goodness. The contrast between tangy and tart leave you wanting more. One cup after dinner will be suffice but I wouldn’t judge you if you go for more. Its delicious, try it! This is a super easy recipe. This recipe was found in Taste of Home recipes. Check them out for more tasty recipes. You can also add grapes, bananas, apples. Have fun! In a large bowl, combine the oranges, pineapple, marshmallows and coconut. Add sour cream and toss to mix. Cover and refrigerate for several hours. Yield: 4 servings. Nutritional Analysis: 1 cup equals 332 calories, 18 g fat (14 g saturated fat), 40 mg cholesterol, 99 mg sodium, 37 g carbohydrate, 1 g fiber, 4 g protein. This post is part of Ms. Latina’s #SabrosoSaturday (hashtag on Twitter) blog hop. Please don’t forget to stop by and check out what other tasty recipes are on today’s virtual menu!